César Alierta is leaving his position as Chairman of Telefonica after 16 years at the helm of the company. But he will remain on the Board of Directors and as Chairman of Telefonica Foundation. 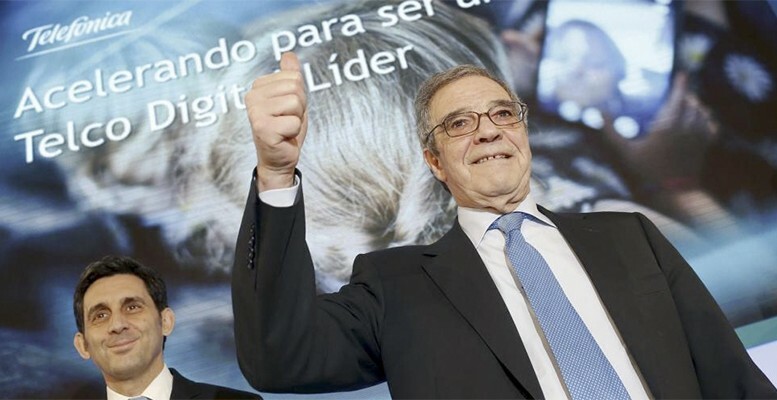 If the Board approves the proposal at its meeting on April 8th, it is very likely that José María Álvarez-Pallete, the current CEO, will be Alierta’s successor. Shareholders will then have to vote in favour of the decision. If all that goes ahead, Álvarez-Pallete will be the first Executive Chairman of Telefonica not to be appointed by the Spanish government. It is not yet known who the next CEO will be, but that’s not an urgent matter for Telefonica as its Chairman has executive powers. Under Alierta’s leadership, Telefonica has seen its customer base grow from 68 to 322 million. But the telecoms firm is now facing important challenges. On the one hand, the European Commission is currently reviewing the sale of its O2 subsidiary to Hutchison Whampoa, with a decision expected on May 19th. This operation is expected to generate about 14 billion euros and is key for Telefonica. It will help the company meet its 2016 DPS payment (0.75 euros in cash), as well as cut debt, thus avoiding a downgrade in its rating (currently at Baa2/BBB/BBB+). The company’s financial debt/OIBDA ratio increased sizeably in 2015 (4.8x vs 3.7x). So the O2 sale has become even more necessary in order to cut that ratio to around 3x. The other main challenge for Telefonica’s new Chairman will be the weakness of the LatAm economies, especially Brazil. The region as a whole accounts for 52% of group income, with Brazil alone accounting for 22%. Bankinter analysts have reiterated their neutral recommendation on Telefonica, as well as their 11.1 euros target price. Some market watchers have compared Alierta’s departure from the chairmanship of Telefonica with former Banco Santander chairman Emilio Botin’s death in 2014. Is there a way out for Spain?